Is the album version Little Girls, or PMIAM? I thought I remembered seeing an image of the back cover of the physical copy back on LDR.FM that had a track listing with some sort of ambiguity on this point... Somebody help me out here. I think I'm remembering now. I believe the ambiguity resulted from the track being labeled "Put Me in a Movie" on Amazon, and probably iTunes as well, but the actual back cover (which appears to be legit) shows it as "Little Girls", and you used to be able to download it directly from the 5 Points Records website where it was also labeled "Little Girls" (and the ID3 tags listed the album name "Nevada Master Ref 1"). See more information here. It's also noteworthy that she uploaded the video for it as "Little Girls". Edit: Kahne also called it "Little Girls" when he was interviewed. I already asked this. But seriously, does anyone have any links to some of Lana's old youtube accounts from her Lizzy grant days. I know I went to her old myspace and it shows her videos are private! That means they're still up. And someone has already told me we found it! so.. if we have.. links? Anything that could give the slightest bit of info on this.. your ideas? I'd just love to know. I don't really think the account is active anyway. FEET DON'T FAIL ME NOW. TAKE ME TO THE FINISH LINE. Yeah, my guess is that it legitimately (or "officially--because people love that term and feel reassured when it's used ) goes by both titles. Or that she changed it to Put Me In A Movie when it came time to sell the record digitally, which had been hitherto known as Little Girls. 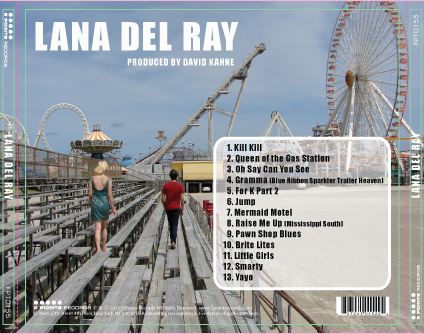 Also, on a kind of related note, the 5 Points site, as well as the alleged back cover posted above, suggest (pretty much irrefutably) that the title of the first record is simply Lana Del Ray. So I should put it in my iTunes Little Girls? Yeah, it's registered under both names, sometimes on the same performance rights organization site. Yes, although I'm certain at one time it was intended to be called Nevada, which would have been a much better title. Is the Summertime Sadness demo just the radio edit? Some people have told me it is, some people told me it isn't so I don't know what to believe and is Blue Ribbon just another name for Gramma or is it an actual demo? I'm not saying it's not possible, it just doesn't seem right. The colors don't go together. I don't think I've ever seen the photo used for the cover by itself (though I'm not an expert on Lana photos) which also makes me think it's real (i.e. if it were fan-made, then someone used a really rare photo). I don't want to overstate the reason for doubt. I just seem to remember CalendarGirl not being willing to confirm it was definitely real. The authenticity of that back cover has never been confirmed one way or the other. If i recall correctly, we originally got it from Calendargirl. I, too, have never seen the photo in any other context. And i’ve definitely seen albums where the front and back covers don’t really “match.” It’s funny, when i first saw it, the first thing i thought (besides that i really liked it) was that, for some reason, the front and back do go together. It made "sense" to me when i first saw it. It's obviously a subjective matter. I’m not a graphic designer by any stretch, but wouldn't you say that the gradients of pale yellow and pale blue complement each other? Also, to me, the picture seems to fit the music of the album really well, although on the other hand, the front cover doesn't fit the music at all, right? I have the feeling that if someone was trying to fake the back cover, it’s likely that they would try to “match” the front cover more, so as to make it more believable. And i also think that the widely accepted misconception of the album title being called Lana Del Ray A.K.A. 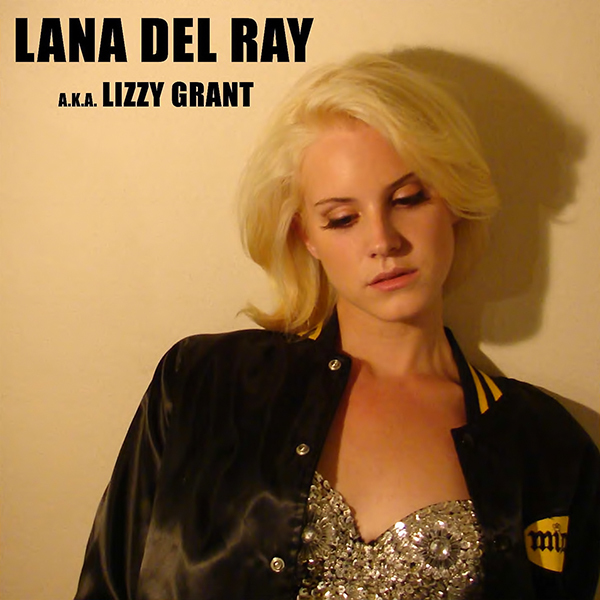 Lizzy Grant would have been used for a fan-made cover, especially considering that this cover photo surfaced before it was brought to light (by European, i think?) that the 5 Points site was simply using Lana Del Ray as the title. Who knows. Until given irrefutable evidence, i think we're all guilty, to varying degrees, of believing what we want to believe. It’s nuts that not even one physical copy has surfaced though, right? Perhaps they were only intended to be distributed at shows, but they never actually got to the point where they were made available at shows, and so Kahne and others are the only ones in possession of copies, which are probably just sitting somewhere stowed away? I wish the cover was bigger, do you think the barcode is authentic? I've wondered before if the bar code can be scanned or if the numbers can be made out and inputted somewhere. But would that make any difference if the physical copy was never sold anywhere? I just remembered someone on .fm pointing out that the green and dotted pink lines are guide lines in Photoshop (?) or some other photo editing program, and that maybe this came from whoever was working on the cover before it was finished. Maybe it was never finished and printed, and the physical copies that Kahne has are only CDs without covers? I'm curious now, does anyone have that b&w fan-made back cover that had the cropped photo of Lizzy on stage with her band and she's got the beehive? I want to compare to a back cover we know for sure is fan-made. Someone on the old forum or SIN made that one, right?